Last summer we spent a few months in Isla Canela, and drove the coast to see as much of Spain as we could! You know me – I want to see everything while I can! 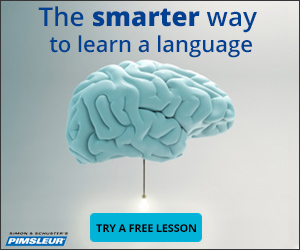 I thought, “Hey! We are so close! 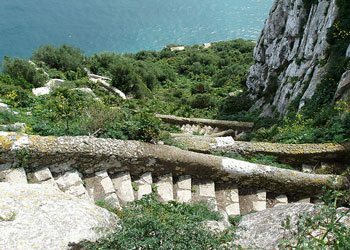 We have to go see the rock of Gibraltar! The boys said, “Ughhh, Mom! What is so great about a rock?! My kids love the stories of the ancient gods, so I just had to tell them that the Rock of Gibraltar was considered by the ancient Romans as one of the pillars of Hercules! The story says that he passed through Gibraltar on his tenth labor stealing the cattle of Geryon. During his journey, he had to cross the sea from Africa to Europe. He smashed his way across the sea, erupting two giant mountains in the process. 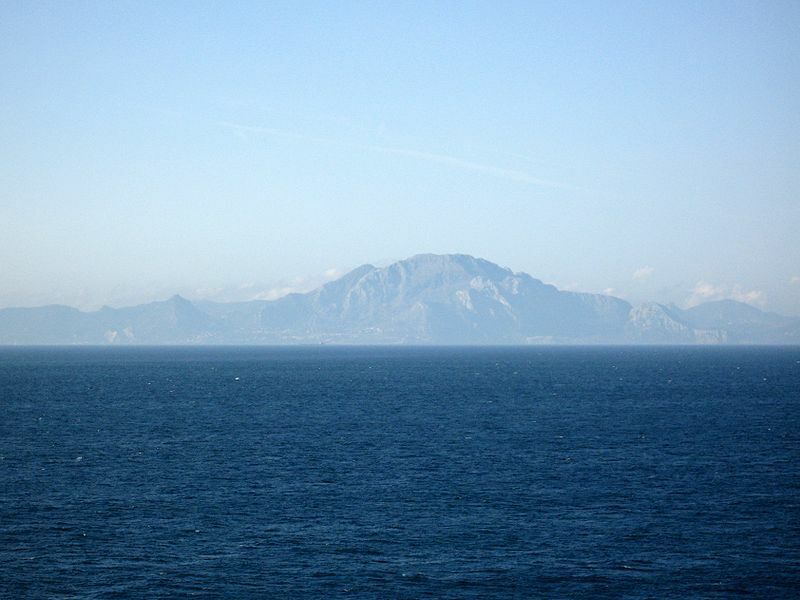 Now those two mountains are called The Pillars of Hercules, one pillar being… the Rock of Gibraltar! There are two ways to get to Gibraltar. You can fly into the airport, that is located directly in Gibraltar, or you can drive in from Spain. The airport is Gibraltar International Airport, you can catch a flight from most of the major airport around Europe. Remember Gibraltar is a British Territory and you need to follow the passport rules for visiting the UK. You can compare Flights to Gibraltar here with Jet Radar, or Check out Vueling Prices here, which is a airline based out of Spain. 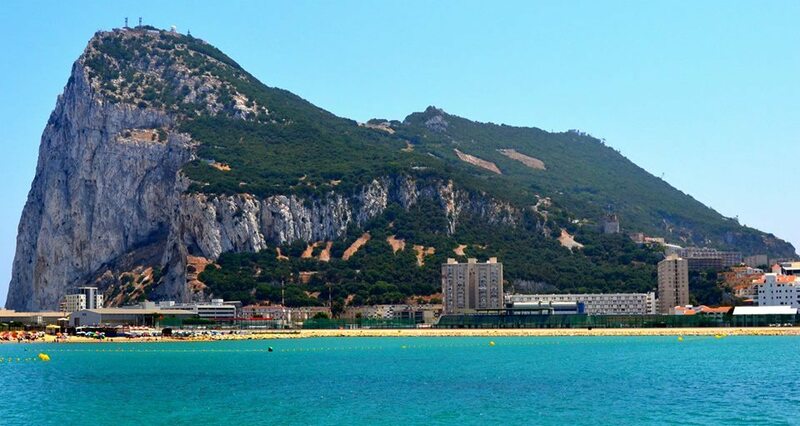 If you are in Spain, you can rent a car and drive into Gibraltar, again remember you have a to cross a boarder with your passport, and meet the guidelines for entering the UK. Check out the best prices on all rental cars here, or click the banner below. A few things we always look for when finding a place to stay, is family friendly, a kitchen/kitchenette, parking, and free Wifi. In Gibraltar our suggestion for families would be Marina Bay Gibraltar, with a full kitchen, wifi, free parking, pool, and sleeps 4. Our suggestion for Couples would be Caleta Apartment/Hotel which also have free parking, wifi, pool and sits close to the beach. You can compare all hotels in Gibraltar Here. A great way to spend the day, is a cute little swimming pool complex called Camp Bay. It’s a rocky beach with a kiddie and adult pool, and swimming area, changing areas, and sunbathing spots. This area is also claimed to have Europe’s first artificial reef. This is a great way to spend the day. Camp Bay is located right on Rosia Road. On a clear day from the Point, you can see all the way to Africa, and the other Pillar of Hercules, Mount Jebel Sidi Musa! We were lucky it was a clear day! My husband (who knows everything, don’t they all) tried to tell me, about 25 times, that we were not looking at Africa until we found this wonderful map that read, “You are looking at Africa!” Gotta take a win when I can get it! 🙂 There is a lot to see here besides the most amazing view, so let’s keep it moving. Trinity is actually a working lighthouse. It was completed in 1841 and is still used to guide ships through the straight. Today, it is fully automated and stands 20 meters (approx 66 feet) high and is sitting 49 meters ( approx 161 feet) above the sea below! What a great view for your Gibraltar Holidays. We enjoyed the view, and as I explained the history of the lighthouse, my sweet boys had a fight over who could lean over the railing the farthest to take pictures of the little tiny fish 160 feet down – proud moment for me. It commemorates General Wladyslaw Sikorski, the Commander-in-Chief of the Polish Army and Prime Minister of Poland, who was killed in a crash while in exiled in 1943. Here, my youngest had a special moment and wanted to know what is exile, why was he exiled, how can you get exiled, why did he crash, where is he buried, can he get exiled, what is exile again? Why, why, why … Why was I not drinking a bottle of wine at that moment?! To your right, when looking at the sea, is Harding’s Battery where you will see a massive cannon that was originally put there to protect the city. The cannon has had a lot of controversy over its placement and size. Although it says it’s a combat cannon, there is no proof it was ever even used in battle. Today it sits on display, used as a viewing platform and a place of remembrance. The Mosque and Shrine of our Lady are both only a few meters away from each other – which both stand for peace between the Moors and the Christians today. The original Church is Catholic and inside has a shrine of Our Lady (another name for the Virgin Mother). In the beginning of the 14th century, the Moors ruled Gibraltar, building a small mosque for worship. When the Spaniards took the town, they converted the Mosque to a Christian Shrine. The Mosque and Church have been through many renovations representing the long time battles between the Christians and the Moors. Today, both are open for public viewing. The Shrine has even received the Golden Rose (a sign of affection from the Catholic Church) from Pope Benedict XVI in 2009. So, after a few ugly words, we were all getting in the cable car. For those who would rather not be trapped in a glass box above the sky, there is a coach trip with hotel/apartment pick up that you can take to the top of the Rock. Check Pricing and Schedule here. I mean, you are in a glass box, whisked 412 meters/1352 feet above sea level, to the top of a mountain in under six minutes! Below us we could see two different continents, two bodies of water, and three separate countries. Impressive! The rock itself is 426 meters high/1398 feet and is made of Jurassic period limestone. The rock erupted from the sea around 200 million years ago! You should reserve tickets in advance to avoid any long lines. You can buy the cable car tickets here. Monkeys interaction is included for free with your tickets, and they really want to hang out with you! We seemed to get there around monkey napping time, but some of little guys woke up and wanted to make friends. One little guy jumped on our shoulders, then jumped from shoulder, to shoulder, to shoulder. He stopped to rest on my oldest son’s head, and then eventually peed all down his back! He started to SCREAM and hop around as if someone had just stabbed him. All of this while the little one giggles and thinks it is the funniest thing that has ever happened in his life. Now that we have seen the monkeys, and smelled their pee, we took a deep breath and looked around! It is truly spectacular! Pictures do not do it justice. There are three decks you can wander around and just take in the wonderful scenery! 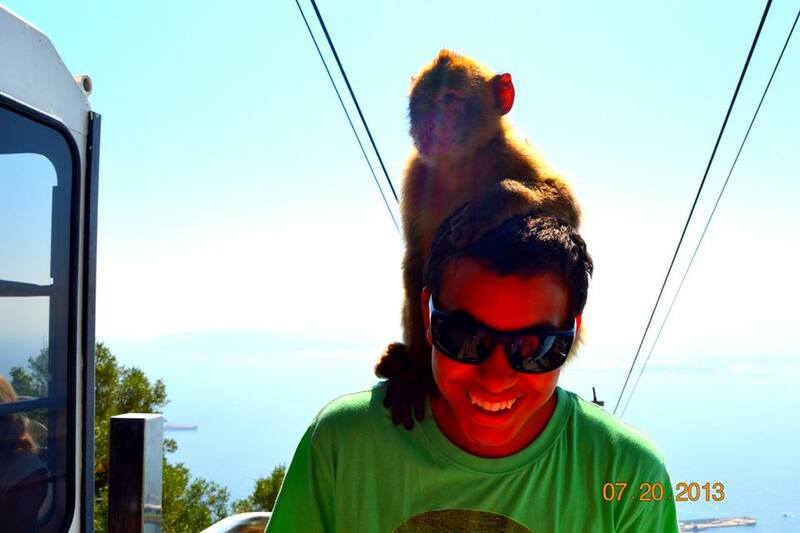 Although the monkeys are cute and friendly, it’s best to steer clear – they are wild animals. There is a big fine if you are caught feeding or handling them on your own. Look from afar. If you are interested in seeing more of the monkeys and learning about their history and life there is a fantastic Experience with the Primatologist who will take you to see the only wild monkeys living in Europe in their natural habitat. You can reserve the Monkey Experience Here. There are a lot of other things to see on the “Upper Rock.” There are the Caves of St. Michael. These are beautiful, stalagmite caves, and in the largest cave they hold concerts because the sound is amplified due to the rock formations. For a long time, people thought the caves were bottomless and that somehow the macaque monkeys came through some secret underground passage way under the sea! You can buy tickets to enter the cave at the shop at the top or bottom of the rock. From here you can walk down and see the Apes Den, the home of the apes, if you have not chosen to take the monkeys experience tour. 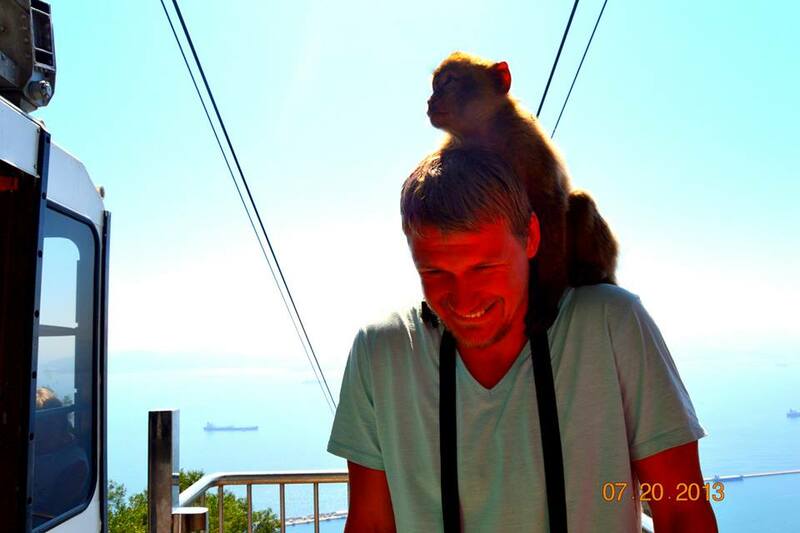 It is said, by the locals, that if the Monkeys ever leave Gibraltar, it will no longer be a British Colony. 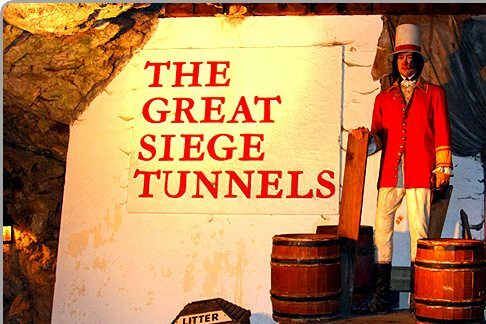 The Great Siege Tunnels are 52 km/32 miles of underground tunnels dug through the rock. These were used in WWII; to secretly leave or arrive at the Moorish Castle. The castle has only its tower still standing. It was built back in the 11th century and used for military protection and battles. 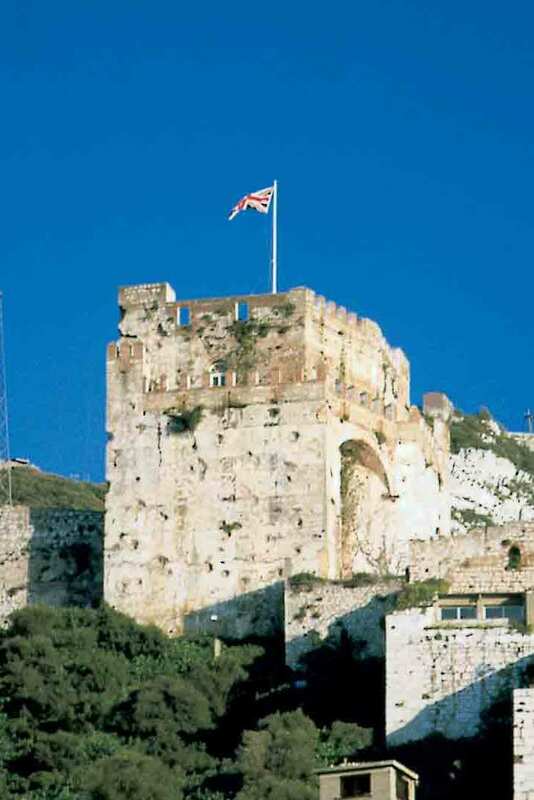 In 1540, 100’s of people fled to the castle for protections against the Turkish pirates attacking Gibraltar. You can also buy tickets for the tunnels at the cable car shop. The Castle was constructed as a fortification. It was built but the Marinid Dynasty, as early as 711 AD. The Marinid were muslim descendants that ruled Morocco between he 13th and 15th Centuries. This is the only castle in the Iberian Peninsula to have been built by the Marinid, making it very unique. You can enter the castle, and see the courtyard and tower, at least what is left of it. The steps are not for those afraid of heights, have difficulty walking, or for people with small children! It is a 1400 meter drop, straight down to the sea. You can climb up or down the mountain via the steps. While it is beautiful, it is also a very difficult walk. We opted out and took the cable car down. I had pushed the kids about far as they could go, and honestly, I needed a glass of wine. There is a cute little historic center in Gibraltar where you should take the time to wander, see the shop, and eat the local food in the area. 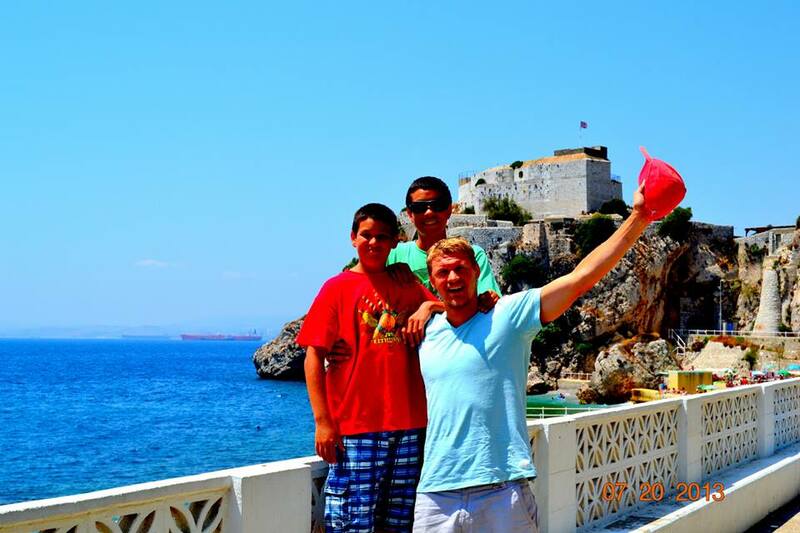 One of my favorite things to do in Gibraltar was the walking and wine tour. You can see the town, learn the history and have some tapas and local wines. I love walking tours, and this one is a blast. 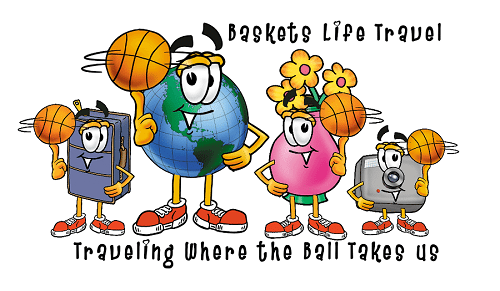 You can check out prices and times, for the walking & wine tour here. 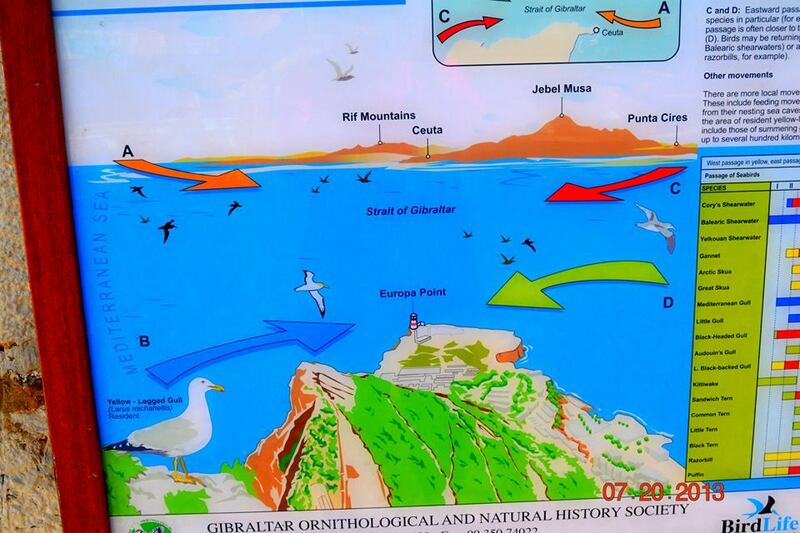 Gibraltar is not only knows for its monkeys, but also for dolphin spotting. Take a day and hit the water on a boat trip to spot the jumping dolphins. You can compare dolphin spotting excursions here. One great day trip from Gibraltar is the city of Jerez de la Frontera. We took this trip and it was awesome. We saw the dancing horses of The Royal Andalusian School of Equestrian Art. The show was amazing and then we visited the winery were authentic spanish Sherry is made and toured the winery and had tasting. Wonderful day in Jerez, if you are in the area, check out this trip. You can see prices, and schedules here. The last day trip I would recommend is a trip to Morocco. I mean you are so close, you can almost touch it. So jump the ferry and take a day trip over to Tangier. You get transportation, a local guide, walking tour, lunch, and an optional camel ride. You can compare prices to day to trips to Morocco here. I hope you enjoyed our tips on all Things To Do In Gibraltar | Your Guide to Gibraltar Holidays as much as we enjoyed visiting Gibraltar. Did I miss anything? Do you have any questions? If so please drop a comment below. Wow! Your photos are fantastic! 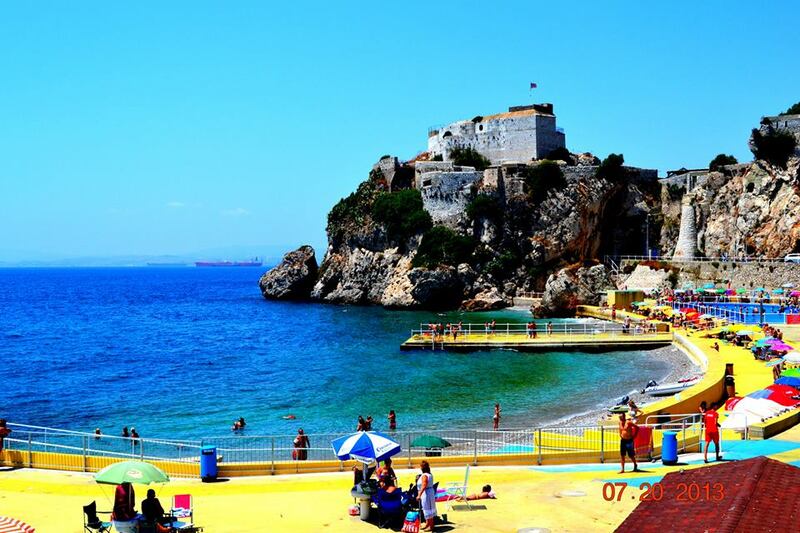 Gibraltar seems like a great travel destination! Do you have any tips for taking the cable car? Can it get crowded and is there any time of the day that it is better to take it? Gibraltar looks beautiful! The sunset shot near the lighthouse is spectacular. How long a trip do you recommend? A little wary of the monkeys though. Smelled monkey pee, haha! St Michael’s Cave looks really intriguing. There's something about stalactite formations that make them look a little creepy and mysterious both at the same time. 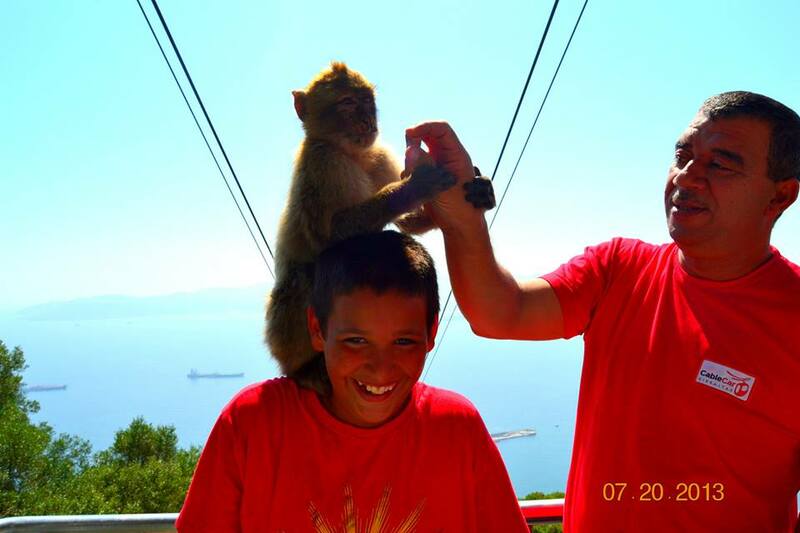 My parents took me to Gibraltar when I was a kid and mostly I remember a monkey on my shoulder trying to steal my snacks! I had no idea you could see Africa and Mount Jebel Sidi Musa from the island, must not have been a clear day when I was there. Need to go back! Love this. This holiday guide is quite helpful and pictures are absolutely stunning. Thank you for reading :) I am glad you like it yes the place itself it stunning so that makes for easy photos. Lovely photos, Stacey! If you like photography, we would like to invite you to participate in the next edition of our Travel Photography competition. Every week we publish 3 winning shots on our website and write a nice bio with a link to the photographers' websites/FB/Flickr pages. Find more details here: http://hitchhikershandbook.com/your-contributions/travel-photography/ Happy travels!